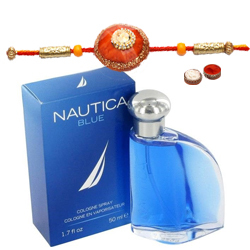 This wonderful Raksha Bandhan gift of Showy Rakhi with Fragrant Nautica Blue EDT Perfume along with a Rakhi, Roli Tilak and Chawal will be cherished by the people you send this to, throughout their lives. This Perfume comes with 100 ml. Bottle.